On 27th of may2016 the local association Keplerforum-Linz presented during a big media conference the project "Keplarium". Erich Gattringer the chairman and developer of this project presented his project. 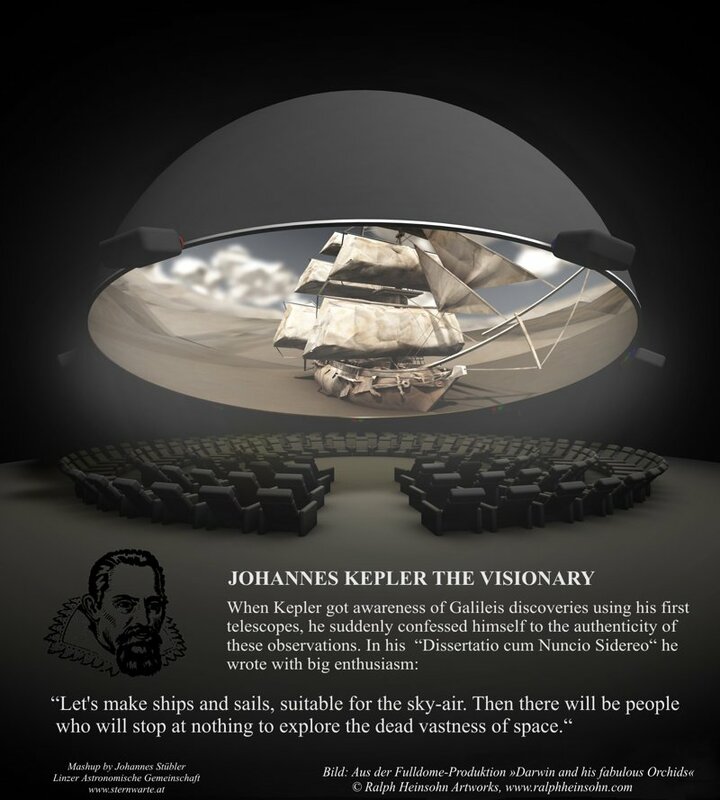 The goal of this project is to appreciate the big achivements of Johannes Kepler. This outstanding character was a famous historic citicen of Linz from 1612 to 1626. In 1618 he dedected his famous 3rd Kepler Law (published in "Harmonices Mundi" 1619) so we soon have to celebrate the 400-year anniversary of this important discovery. During the media conference Erich Gattringer presented his project supported by representatives of economy and science. 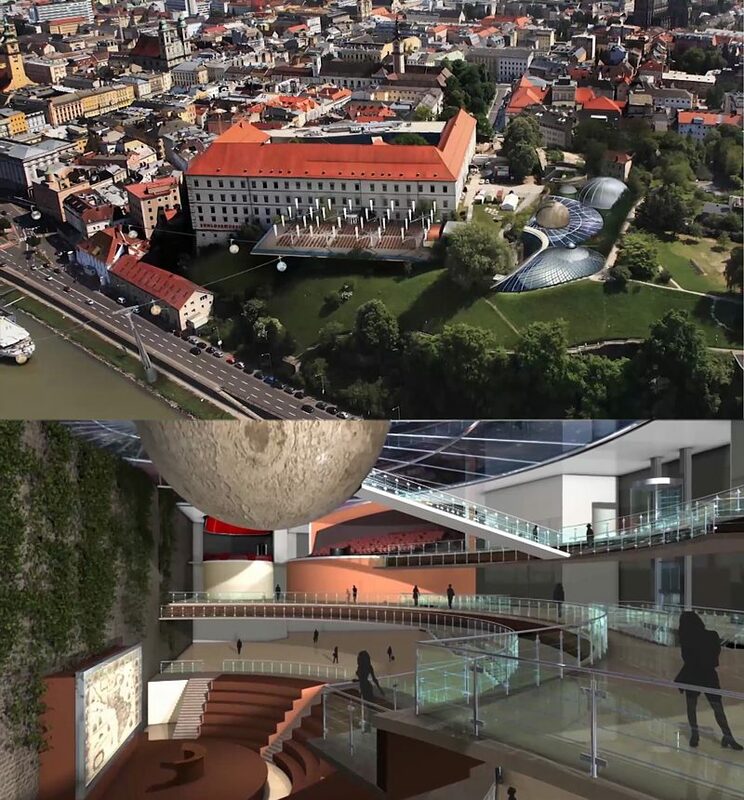 First look on the architecture of the planned Kepler-Center at the top of Schloßberg-Linz. Planned are a big fulldome-presentation-center, called "Keplarium", a science center including restaurants and a big event stage. Erich Gattringer inspecting the area together with Dionys Lehner an important industrialist, mentor and supporter of this project. 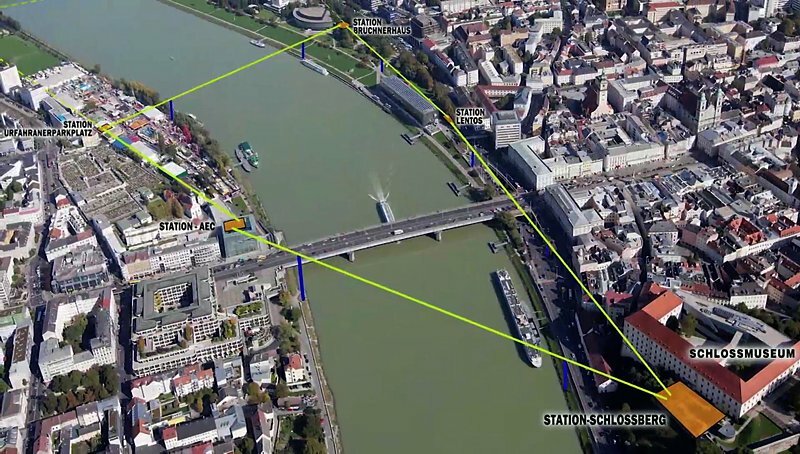 Existing cultural institutions along the Danubian riverside could be connected in a worldwide unique and fascinating kind by the planned "Kepler-planets-cable-railway". Future visitors are hovering in transparent planetary-cable-railway-gondulas enjoying the view of "Keplertown-Linz"
The mountain area of Schloßberg Linz and other places could easily be reached without any parking problems. Local newspapers and TV stations reported very friendly about this big project. The fact, that this project should be realized only by private sponsors without any charge on the taxpayers aroused much interest. Creating a bussinessplan including return on investement, creation of a good marketing concept, getting construction approvals and operating licenses. "LINZER ASTRONOMISCHE GEMEINSCHAFT - JOHANNES KEPLER"
Already in the year of foundation of LAG in 1947 the big name of Johannes Kepler became part of the full name of the association. 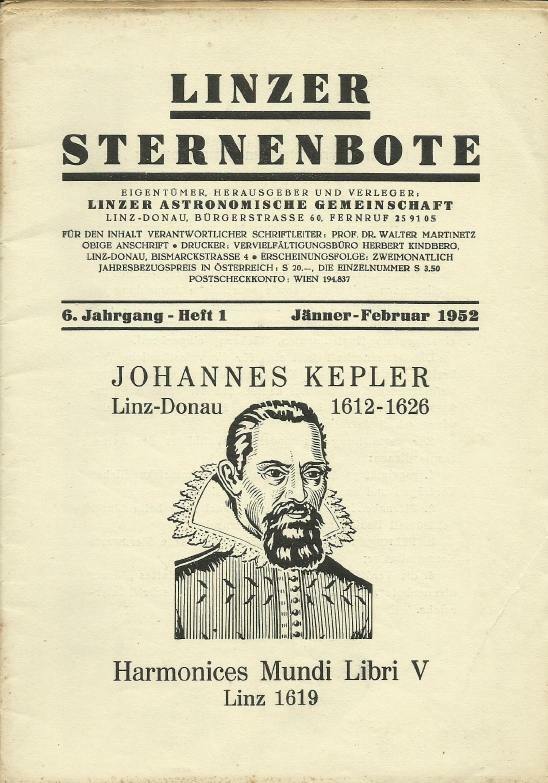 Even in the former periodically prints called "Linzer Sternenbote" Johannes Kepler was displayd on the cover page. 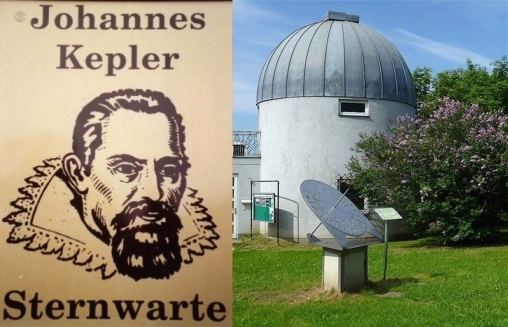 Today Kepler is still part of our club organ header "WEGA"
The local observatory was 1990 officially named to "Johannes Kepler Sternwarte" (Sternwarte=observatory). 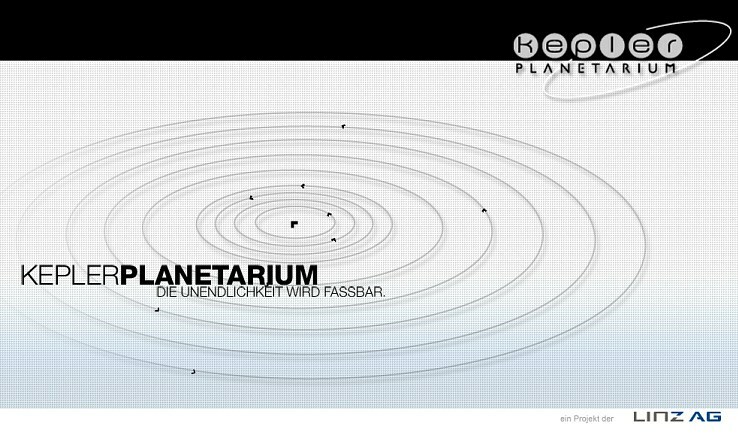 Further already 1990 a planetary educational trail, devoted to Johannes Kepler, was established and opened. 2015 the poster panels of the planetary educational trail have been redesigned and renewed. At the start of the trail above plate is displayed. QR-Codes on all poster panels allow visitors to get more informations using cell phones or tablets. The world biggest Planetarium (was established in the year 2002 by Linz AG supported by Linzer Astronomischen Gemeinschaft. The center of the MEGA-model of our solarsystem is a spherical natural-gas tank representing the sun. The planets are scattered around in Upper Austria. 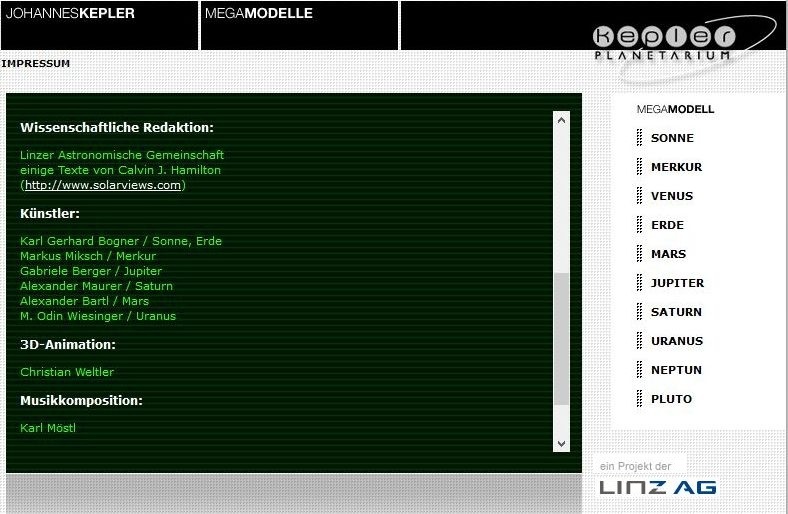 The decades-long efforts of the local asctronomical association "Linzer Astronomische Gemeinschaft" (LAG) to honor Johannes Kepler may find it's proceeding in this unique project "Keplarium". We can only hope that this project will be realized and the local decisionmakers are aware of the big possibilities of this project. Hopefully together with all supporters, mentors from economy and science we can make this big vision happen. Of course LAG will support this project as far as possible ! VISIONS HAVE TO BE REALIZED ! 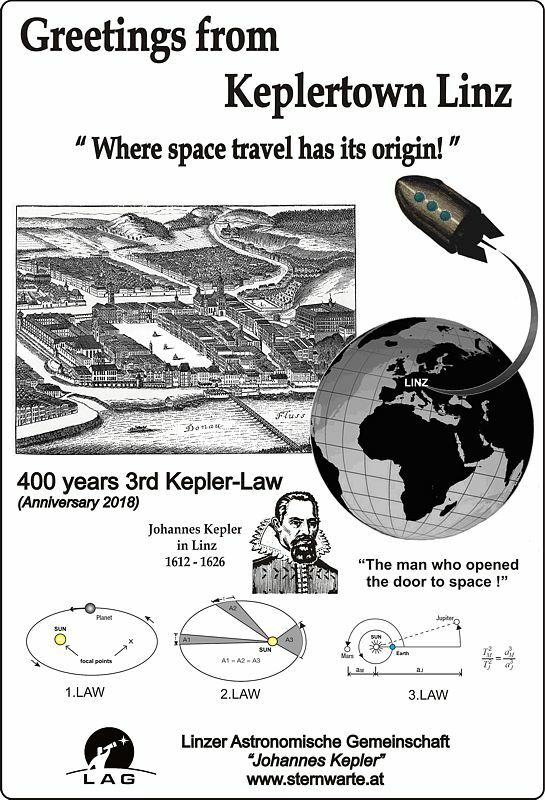 Like the visionary Johannes Kepler has predicted the possibility of space travel, he enabled in fact by creating his 3rd Kepler Law. The planned combination of "Kepler-Planets-Cable-Railway" and "Keplarium" could surely be a worldwide unique attraction. Johannes Kepler would be delighted with all planned local activities to honor his person.